Fluffy is such a character, where to begin. For a small kitty who's 50% fur, she's packed with personality. She never lost her temporary nick name, which although it's generic & not very original, came to fit her just fine. Fluffy was born in a deep Hav-a-Hart cardboard box with 5 siblings to mama Moonpie. 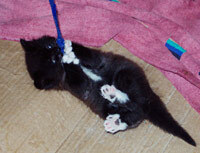 She was the tiniest in the litter & had to struggle to get her share of nourishment. Moonpie was still quite feral & it was tricky to help Fluffy get a good nursing position without upsetting Moon. We started feeding Fluff soft canned food early to help fill her tummy, which she would wolf down. Maybe that influenced the voracious appetite she has today. 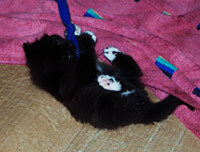 Fluff's the only long-hair in the litter & was an extra-adorable kitten. She didn't much like being held, preferring to play & get rowdy, but she's become quite a lap cat. She's still a scamp, always ready to play with a devilish glint in her eye. She's always reaching up if you are trying to eat or prepare food, meowing loudly & persistently until you relent & give her a morsel. 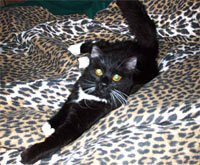 Her meow is loud & creaky & insistent, unlike her siblings, who squeak softly. When Fluffy's not causing mischief, she likes to curl up in your lap or on a cat tree for a long snooze. She's definitely become super-cuddly, although she's still rowdy as well.